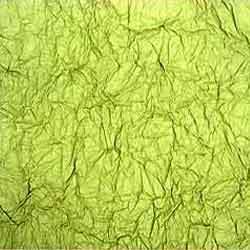 We are engaged in manufacturing of Green Textured Batik Paper, which is highly appraised for its striking look and perfect finish standards. Handcrafted with intricate designs and alluring patterns, this batik paper is available with us in various sizes and specifications. Uplifting the luxurious look of decorative item, with its completely natural and 100 % bio-degradable material, it is offered at competitive prices. Backed by a rich industry experience of this domain, we are engaged in manufacturing and exporting of a wide range of Handmade Paper & Paper Products. Our offered range includes Handmade Floral Paper, Handmade Crocodile Paper, Handmade Batik Paper, Handmade Embossed Paper, Handmade Dew Paper, Handmade Leather Paper, Handmade Paper Note Book, Handmade Paper Bags, Handmade Paper Stationery, Handmade Paper Boxes, Handmade Paper Photo Frames and Handmade Paper Album. By offering these eco-friendly and 100% wood free products, we have formed cordial relations with prestigious associations like All India Handmade Paper Association, Export Promotion Council of Handicrafts, KVIC (Khadi & Village Industries Commission), Forhex and many more. Leveraging on our well developed infrastructure unit and dexterous efforts of our experienced professionals, we are able to offer recyclable product range. Our expert professionals work round the clock to meet the ever changing demands of our valued customers spread across the globe. Our expert quality controllers make use of advanced quality testing equipment for checking the products on well defined parameters, ensuring defect free range is dispatch in the market. We also have a capacious warehouse that facilitates us in safe storage of our Handmade Paper & Paper Products. With our wide distribution network, we are able to deliver our bulk consignments safely in different parts of the world.